Once again, Princess Arianna faces a threat to her kingdom - this time, it comes from the north. The Princess needs your help in her difficult journey! Only you can control the power of the magic cards. Show your solitaire skills and help the Princess to defeat the Ice Queen before the land is sealed in eternal winter! 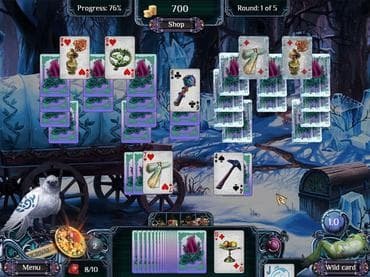 Free Game features: - Charge your royal amulet; - Combination of solitaire and hidden objects; - Defeat the Ice Queen! If you have questions about The Far Kingdoms Winter Solitaire game, please contact us using this form.